In March of 2007 the total size of the U.S. subprime mortgage market reached $1.3 trillion. 18 months later, in the fall of 2008, subprime debt became toxic throughout the financial system when buyers realized that homeowners would be both unable or unlikely to pay back the loans. In March of 2014 the total size of the junk bond market worldwide crossed $2 trillion. The market has doubled in size from early 2009. Are junk bonds more valuable than subprime mortgages? Junk bonds receive their name because they have a high risk of default. When a subprime mortgage bond defaults the worst case scenario is that the bond holder receives the value of the underlying home which can be sold for a percentage of the bond's purchase price. When a junk bond defaults the worst case scenario is that the bond holder will be left holding only a worthless I.O.U. (and maybe a letter of apology from the company they were dumb enough to lend money to?). We know junk bond holders will be slaughtered, but how big of an impact will it be to the financial system and surrounding markets? That is impossible to quantify because we have never been in a central bank QE induced global hysteria combined with governments drunk on deficit spending. My guess is that the secondary impacts will be far greater than market participants are expecting, considering the fact that many stock markets (and real estate markets) around the world are sitting at all time record high prices (Remember, it took 18 months following the peak of subprime mortgages for the markets to fully realize the damage to the financial system). So where are we now in the junk bond debacle? The very early stages. 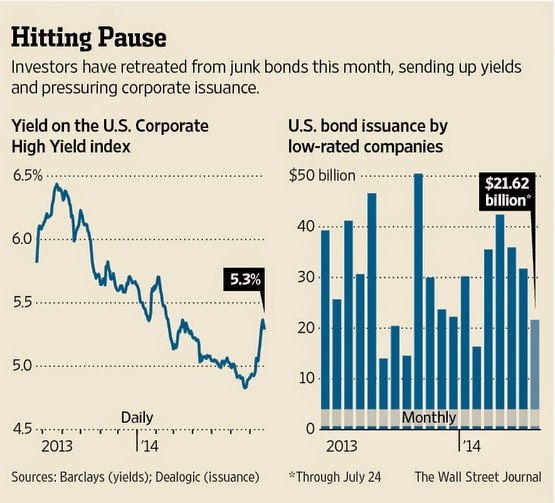 Investors began to sell high yield (junk bonds) slowly a few weeks ago and that trickle has turned into a flood. Yields have rocketed higher off the insane record lows (bond prices fall when yields rise). High yield bonds experienced record outflows this week of $7.1 billion, the fourth week in a row of massive outflows (prior record was $4.63 billion of outflows in June 2013). Is it possible this is just a hiccup on the way to new all time lows in junk bond yields? Of course. Be mindful, however, that this market has perhaps been the greatest beneficiary of the Federal Reserve's fire hydrant of liquidity since 2009. That hydrant (we are told) will be turned off by October. At some point, just like with subprime mortgages, the market will have its "uh oh" moment. That moment could have arrived 4 weeks ago and the insanity surrounding junk bonds may finally be coming to its conclusion. Many companies have had the ability to borrow an unlimited amount of money (by selling junk bonds) and using the cash to repurchase their shares. As the cost to borrow rises (or disappears for many companies) it will become far more difficult to continue this ponzi finance.